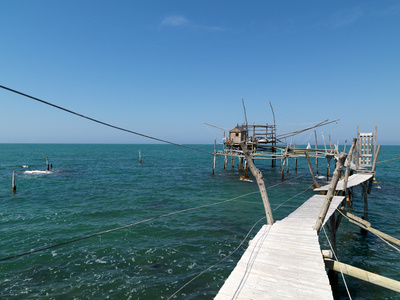 Article first published as The Trabucchi - A Fishing Experience on Technorati. Imagine that you are on holiday in Italy. It is a gorgeous summer day, the sun is shining brightly in a perfect, cloudless sky. You have rented a convertible, the roof is of course open, and you are driving along let's say the Gargano, a magnificent coastal area in northern Puglia. Suddenly, a funny wooden structure attracts your attention. You decide to stop the car and investigate. It turns out to be a rather basic pier, built with wooden planks and poles, and held together with ropes and galvanised wire. The uneven footbridge takes you to a platform, where a lonely shack stands. All around the hut, masts reach out over the sea. A more thorough inspection reveals a quite complex structure, orchestrated by an impressive number of wires and pulleys. The nets folded on the timber faded by the sun and the rain solve the mystery: this is a fishing device. Turning around, you notice a small building very close to the fishing pier. It does not look like a house, rather like a very simple restaurant. As you want to find out more about your discovery, you decide to go in and enquire. The owner and his wife are very welcoming. You order some rosé wine and as the restaurant is empty except for you, the couple joins you at the table. They speak some English and are happy to answer your questions. First of all, you learn the name of this peculiar machine: a trabucco. It is said that this fishing technique was invented by the Phoenicians. Back in the 18th century, it was a popular way of catching the fish as it was not dependent on unpredictable weather. It was built out of pine, a hard wood also resistant to salt. It took several men to operate a trabucco as some had the duty to watch when the fish banks were approaching and others to manoeuvre the structure. Nowadays, the function of the trabucchi is no longer economic, but cultural, and a popular tourist attraction. Not too many of them have their own eating facility and most catches are destined to local, typical restaurants just like the ones you have already enjoyed during your stay. The afternoon goes by quickly, and soon it is time to think about dinner. You simply do not want to leave this lovely place, and therefore ask the owners if it is possible to eat. You are lucky, fresh fish was indeed caught today, and it is quickly grilled for you and served with fragrant bread and a crisp salad, while the vibrant evening colours slowly turned to dark ink. After a last espresso, you leave the couple that now feels like your new friends, and you promise to come and visit them again.